We'll show you how to add a human touch to your drum parts. 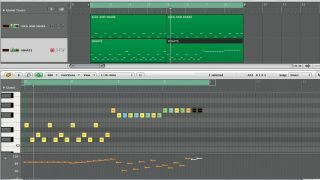 In this tutorial, we'll show you how you get from a basic programmed MIDI drum pattern to something that sounds like it's being performed by a real drummer. This is achieved using a combination of velocity, timing and the use of articulations. As you'll see, it's impossible to overstate how important articulations can be, particularly with regard to feel and 'humanity'. Also, a good drummer will be able to push and pull the timing of a groove, playing behind or ahead of the musical pulse. 1. The most important element for tweaking to add feel to drum parts is the hi-hats. Drummers instinctively accent the hits that coincide with the kick and snare, and we can do this using velocity and/or articulations. Here, we've gone for the latter, choosing an even more open sound to go with the kick hits, so that they're accented slightly more. 2. You can extend this concept with the 'pea-soup' hi-hat. This is an open or semi-open hi-hat hit that's immediately choked by the next (closed) hit. Here we're adding a pea-soup hat every other bar on the last eighth-note, playing a looser articulation. You'll want to set your ROMpler up to automatically choke the hi-hat on the next hit. 3. Our next hi-hat variation is the gradual introduction of open hats over the last bar or two of a section. This is a good technique for signalling the change to a new section or building into a short fill. Notice that we're not only shifting articulations but also gradually increasing the velocity. 4. A great way to add feel is to play the hi-hat or ride cymbal on your MIDI keyboard. Here, we've recorded our 'human feel' hi-hats on one note, then converted the result into a quantisation template - a feature you'll find in many DAWs. We then apply the template timing and velocity to the multi-note programmed part, thus retaining our carefully selected articulations. 5. Moving on to song section variations, you'll often want to switch from the hi-hats to the ride cymbal for the chorus. An easy way to do this is to simply copy the hi-hat part, then modify it to match the available articulations - this may well involve tweaking velocities, too. Finally, for tighter timing in the chorus, increase the quantise percentage on the accent beats to tighten up the groove. 6. A less common variation is to shift the hi-hat part to the floor tom. Here, once again, we've adjusted it to match the articulation and velocity. We can also repeat the snare variation every two bars. Finally, on every fourth bar we stop the toms on quarter-note 3, bringing both hands together to play a snare flam - see how the two notes are played closely together for a big 'blat!' sound.